Stefan Fatsis, a sportswriter for the Wall Street Journal, scored a leave of absence from his job to try out for the big leagues of competitive Scrabble. 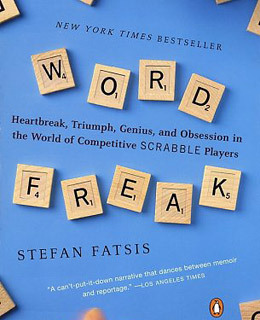 A talented wordsmith, he quickly realized that the game "living room players" like himself are familiar with bore little resemblance to that practiced by Scrabble geniuses  a motley bunch whose personality disorders run the gamut from addiction and gastro-intestinal distress to chronic underemployment and social anxieties. Fatsis chronicles their foibles and gifts with insight and empathy, and his own quest to become one with the board is unexpectedly gripping.